excerpt from ``Remember When...`` by Yvonne (Arsenault) Tuplin, published in 1998. 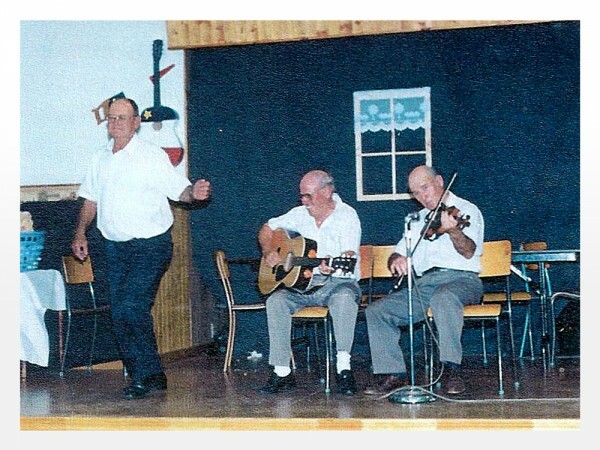 Old-time fiddle music and dancing was as much part of our lives as bread and molasses. Almost every Sunday after church, Dad would play the harmonica while we danced and someone sometimes played the spoons. It was such a lively time until Mom announced that dinner was ready. We often heard fiddling on the radio or on television. Don Messer’s Jubilee was a family favourite. We also watched a variety show called Shur-Gain. From time to time, there would be a concert at the parish hall. Mostly everyone in the community attended. I started step dancing when I was around seven. My father would do a few steps from time to time, but mostly I learned from girls at school or watching dancers on Don Messer. Throughout the year, fiddling and step dancing contests were held all over the Island. I would go with Mom and Dad and enter numerous contests. I began to really enjoy it when I started winning. I would spend hours practicing and learning new steps. They had different age categories at the step dancing contests. Mom even entered from time to time when there were only one or no contestants in the adult category. She was sure to win. Amand à Arcade would enter too and they would come home with either five or ten dollars. The prizes were usually fifteen, ten and five dollars for first, second and third prize. Some bigger contests such as the one in Tyne Valley had twenty-five dollars as first prize. Mom made me an outfit one time as I didn’t have a good dress to go to a big contest. It was a two-piece skirt and top in a pink and white print. I was very happy to have something new to wear and I won first prize that night. Sisters Yvonne (Arsenault) Tuplin and Claudette (Arsenault) Yeo step dancing. Eddy Arsenault was my favourite fiddler. I don’t remember the others by name except for Russell Warren of Summerside. I would always ask Eddy to play the “Princess Reel” for me while I danced. His brother Amand à Arcade usually accompanied him on the guitar and Eddy’s daughter Marie sometimes played the organ. His daughter Helen was also a very good step dancer. As an adult, she was part of the talented, energetic musical and comical group, Barachois. Our family is related to the group’s fiddle player, Louise Arsenault. Eddy’s son, Albert, and Chuck Arsenault would have you rolling in the aisles with laughter. This sort of entertainment is keeping the Acadian folklore alive. Years ago, the step dancers from our area were asked to dance at the political conventions. The pay was great. I’ll never forget one Conservative convention when five or six of us danced that evening. Lucia à Tilmon didn’t have any tap shoes so she borrowed mine as she was ahead of me on the list to dance. Because the speeches had gone over, there was no time for us to dance individually. Without notice, everyone had to go on stage at once. Lucia went on with my tap shoes and I was wearing rather loose penny loafers. As we danced in a row, my shoe went flying off the stage. With much embarrassment, I managed to retrieve my shoe and continued dancing with the group. When we finished, I ran and hid in the stairway and cried. Cyrus à Joe Manuel came looking for me as he wanted to pay me. I told him I didn’t deserve it. He said I had done a good job in spite of what had happened to me. When I see a good step dancer now, I get goose bumps. I still have my dancing shoes but they have seen better days. After I left home, Claudette became the dancing sensation of the family. She danced with the Acadian group the Evangeline Dancers. This troupe danced at different events on the Island and made it to Spain and France. My! What a celebrity! 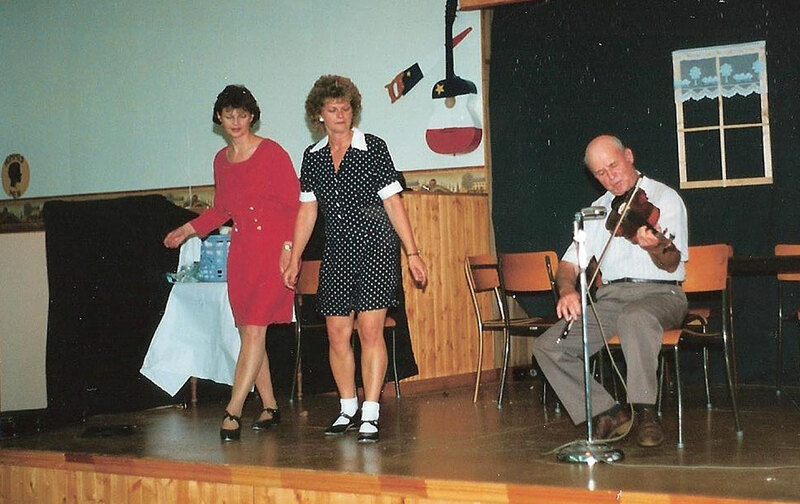 In the last few years, my sister Claudette and I started step dancing lessons with Marie à Polycarpe. Some of the steps are similar, but most are different than we are used to with two or three steps are combined into one. It is much more complicated than when I was young and I don’t have the memory to always remember what comes next.